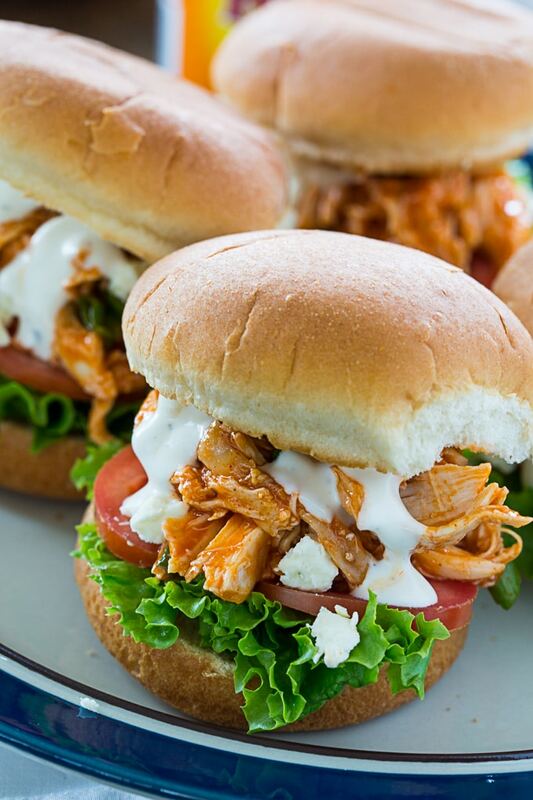 Buffalo Chicken Sliders made with shredded rotisserie chicken tossed with Buffalo sauce, blue cheese crumbles, Ranch dressing, lettuce and tomato make an easy and delicious game day food. 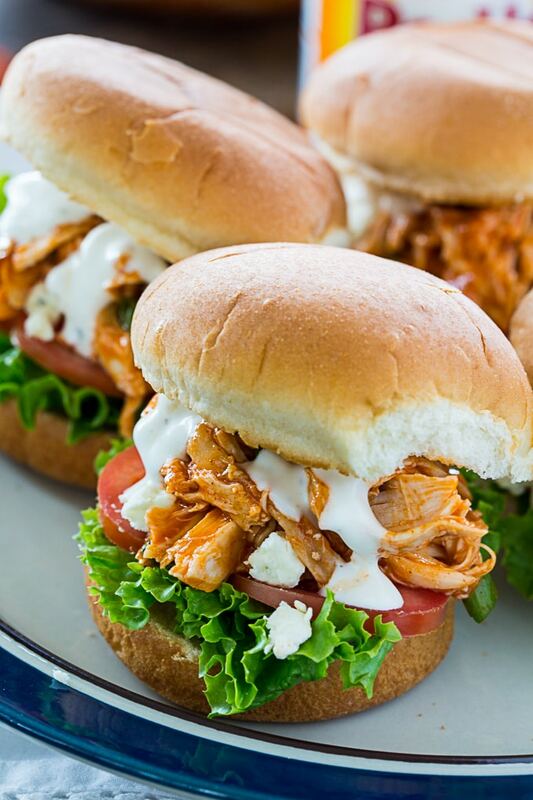 There’s plenty of heat and flavor in these sliders and they only take minutes to make. I love to order Buffalo Chicken sandwiches at restaurants. Normally if you get a Buffalo Chicken wrap or sandwich at a restaurant, it’s deep fried before being coated in hot sauce. These sliders are a little more on the healthy side. Now, I’m not kidding myself into believing this is a super healthy meal. But the chicken isn’t fried and there is no flour coating. 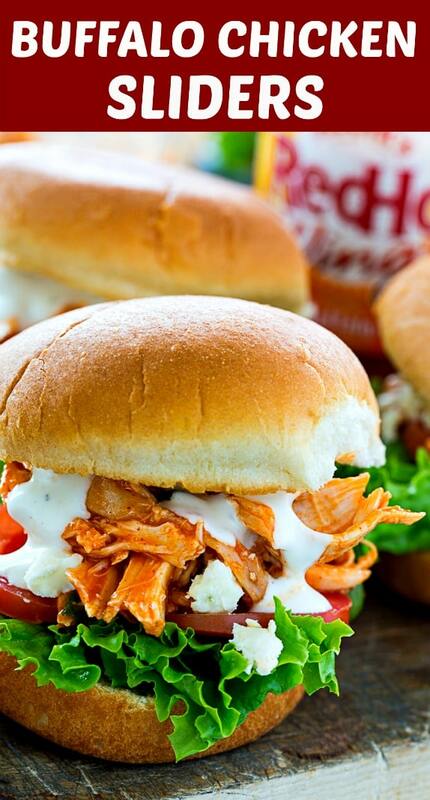 Since rotisserie chicken is used, these Buffalo Chicken Sliders can be made in just minutes. They are plenty spicy and packed with flavor. Remove the chicken from the bone right when you get home from the store and put it in a ziptop bag until needed. The chicken is much easier to remove from the bone and shred when it is warm. The chicken can be tossed with the Buffalo sauce up to 48 hours in advance. You can use either slider buns, rolls, or Hawaiian rolls to make these sliders. I like to use the combo of blue cheese crumbles and Ranch dressing, but you could use Blue Cheese dressing for more blue cheese flavor. I like to use Frank’s Red Hot Buffalo Sauce. 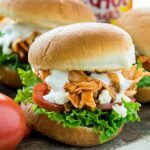 Buffalo Chicken Sliders are perfect for game day and with their miniature size kids love them too. Buffalo Chicken Sliders made with shredded rotisserie chicken tossed with Buffalo sauce, blue cheese crumbles, Ranch dressing, lettuce and tomato make an easy and delicious game day food. 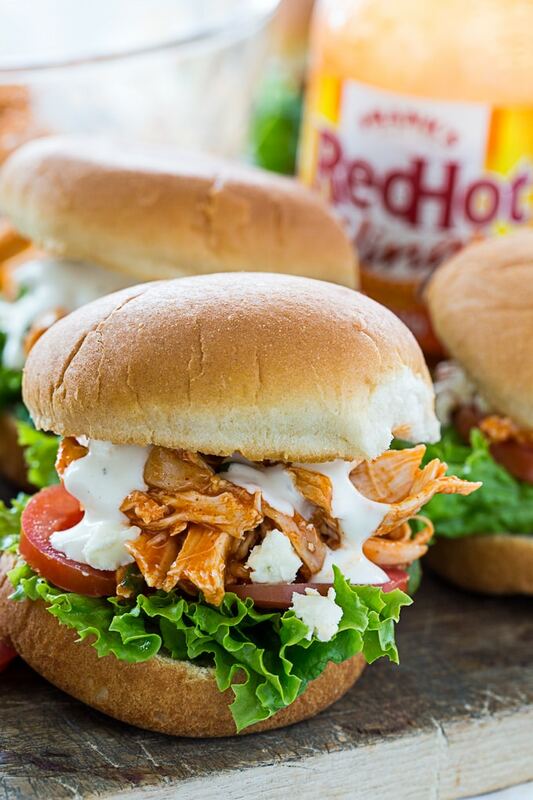 There's plenty of heat and flavor in these sliders and they only take minutes to make. In a medium bowl, combine chicken, buffalo sauce, and green onions. Note; This part can be done up to 2 days in advance. Warm mixture in microwave before making sliders. Place lettuce and tomato slices on each slider bun or roll. Top with chicken mixture, blue cheese crumbles, and ranch dressing. This entry was posted in Appetizers and tagged Appetizer, buffalo chicken, chicken, finger food, poultry, sliders. Bookmark the permalink.